The M-6 pre-amp is the twins to the Maestro, Six indicates it uses the very popular 6922/6DJ8 instead. It features two 6922 or 6DJ8 (One each per channel), and the same but enhanced excellent tube power supply and phono stage (100X) design from the PRELUDE/Maestro/Triode Lab's Au Pres. This model is made to the popular request, as many audiophiles liked the good sound, authority and quietness of the 6922/6DJ8. In fact, the 6922/6DJ8 tube is widely available new or nos. This is made for the “audiophile” familiar with tube amplifiers and in this case knows or appreciates (on hearing) how the 6922 sounds. The 6922 (6DJ8) is one of the most commonly used preamp tubes for Hi-Fi applications. On the mechanical side, the 6922 tube offers low noise and power. However, it does have higher internal heat. Which means if the circuit design isn't flawless, then there is always a greater chance to end the 6922’s life unexpectedly. With our M-6, unlike most other 6922 designs on the market, we use low voltage instead of high voltage. This means you will have to change less tubes and less chance of a problem down the road. The line stage deign is a two stage configuration, running single ended Class A, with one stage working as voltage amplifier, and one stage used as cathode follower. So what are the advantages of using a cathode follower? It allows us to connect multi-outputs, it won't lose gain, has the power of driving solid-state amps, and no need to worry about running longer interconnect cables. To have everything working at optimal parameters (including numbers/specs), the power supply is equipped with a power regulator to ensure a stable power supply thru out the day and night, and that it sounds / performs / measures the same around the clock. Of course this also ensures the preamp is operating at its best condition mechanically speaking, and quiet. We use tubes for rectification and regulating, (6Z4 for the power supply and 12BH7 for regulating). What makes the M-6 standout? 1. Phono stage, a 100x design that will take MM and hi output MC carts. While not a unique design, this is not just a quick parts insert procedure, and I really want to point out NO IT ISN’T. As a result, ours will be much quieter in comparison to most. And that is crucial because that is the foundation of your vinyl source. Imagine you have a good MC amp or step up, but it's useless when your line stage and phono stage is not quiet enough - the upstream source always dictates the final result even when you have the best counterpart power amp. 2. What make this 6922 unique-in design and sound? It is a direct coupling design without coupling caps in the way. The result - the bass response is better utilizing direct coupling and it will sound more direct, and accurate. Finally, and perhaps most important, there is no phase shift between 0 Hz to 20 kHz. 3. We also applied what I consider a perfect amount of NFB, where appropriate, for better performance, safety, and muscality. And as long the 6922 / 6DJ8 is not too old and have no mirco-phonics, even down to 50% life, the preamp will still work as it should, and safely. This preamp is just made for the audiophiler's who already has a bunch of tubes. As powerful and high quality to the Maestro, the M-6 offers 8X gain of Pre-amplifications that measures even quieter. The M-6 is Quieter/Cleaner/Controlled/Higher Gain/Super-accurate sounding (If you look carefully, you can see the Maestro uses high-end Mundorf's coupling caps, but we don't use any on the M-6, and the 6922/ECC88 will dictate the sound of the M-6), where as the Maestro comes in totally opposite tune - Warmer/Open/Natural/Vivid/Colorful. 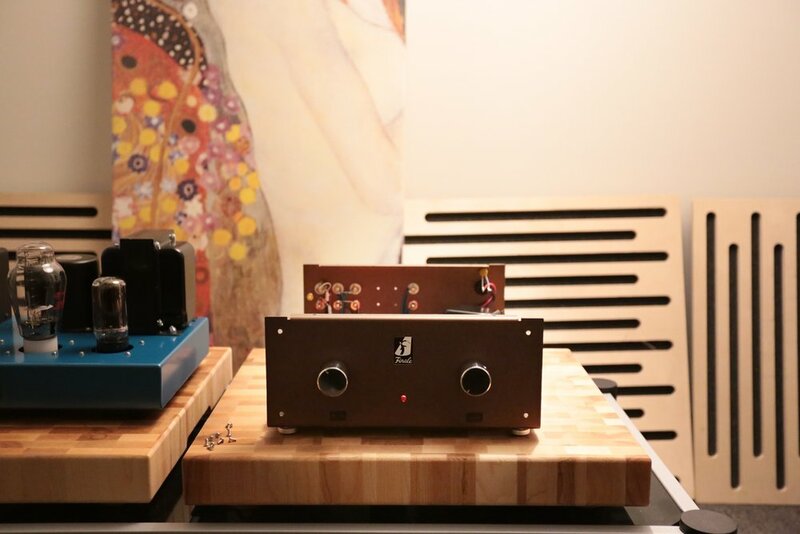 Both can be an end-game tube pre-amplifier through perfect matching to your power amplifier counterpart. For example, the M-6 is perfect for musical tube power amplifiers, such as our F-138/F-300B & MB & RS/F-7591/F-40II/F-120II MB and so on. On the other hand, the Maestro is perfect for big power solid state / hybrid amplifiers, and will blow life and colours into them that even their matching solid state pre-amp cannot be done. If you want a hybrid system or add some tube favours into your system, this is it. Each of their own sound is distinctly good for two different bunch of listeners. Depending your light source, in a darker place, it gives you a more solid dark brown finish - much like coffee beans. But here, with sunlight thru big windows, it became a very tasteful mocha/cocoa colour, thanks to the light metallic based paint. MSRP $4,500 CAD/USD/EURO, well equipped. Simple = Purest. Unnecessary features and functions, each will add an impact to the sound and purity.